The goal of this project is to exploit the sensitivity offered by the SERS (surface enhanced Raman scattering) effect as applied to label-free detection of target biomolecules for medical and fundamental biological applications. Currently available assays and sensing techniques involve either tagging of the target molecules with fluorescent markers and/or incorporating a secondary tagged-molecule. These conventional approaches are subject to numerous limitations (i.e., sensitivity, specificity, complexity, expense, assay time, possible loss of activity, photobleaching, toxicity, etc). Present studies seek to develop assays for direct or indirect detection of biomolecules. Current projects will provide efficient means of directly/indirectly detecting target biomolecules and allow monitoring of intracellular processes. These are important steps in medical diagnostics, drug development, anti-biological and chemical terrorism as well as in environmental monitoring. This work extends previous work on nanoparticle probes for biochemical assays developed by CBST researchers for chemical and biochemical assays including assays made in the interior of living cells. The basic idea uses gold or silver nanoparticle (50-100 nm in diameter) probes coated with chemical groups that bind specifically to other chemical targets in the local environment. The chemical binding can be monitored optically using SERS. akly bound to the nanoparticle surface and labeled with methylene blue which produces a strong SERS signal. When exposed to the target protein, competitive binding causes the aptamers to preferentially bind to the proteins in solution thus reducing the SERS signal with increasing target concentration (see figure). The third approach uses covalent binding of a receptor molecule that connects two nanoparticles and produces a stable region of high electric field. A change in the SERS signal is produced when the connecting molecule is modified by binding to a target molecule. 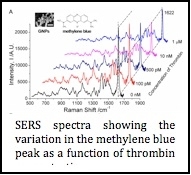 The first two approaches were with the target protein thrombin and the third was used to develop a SERS based pH sensor.